The online Batch Pick software optimizes shipment orders into batches and also plans pick routes to minimize travel distance required for picking orders in warehouse. The software accepts shipment order data and returns pick batches and paths. It helps you speed up order fulfillment and simplify warehouse operations. The software can be used online without installation or integration required. 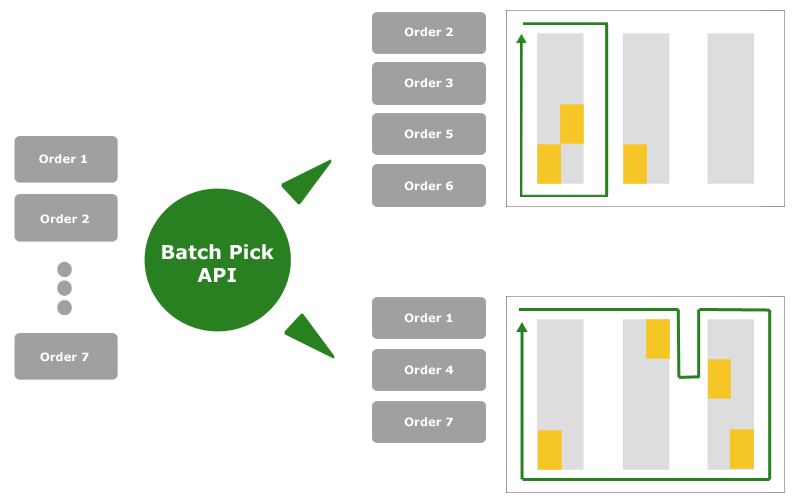 The optional accompanying Batch Pick API is designed for software developers to integrate with in-house WMS or ERP systems seamlessly. The online software enables you to simulate the picking process to find the optimal warehouse floor plan, location of storage racks, aisle widths, aisle traversal direction, product storage assignment, pick zone partition and boundaries, and picking strategies. The picking strategies supported include batch picking, zone picking and pick-and-pass. Secured API key for integrating the optional Batch Pick API programmatically to your own application. Experiment and analyze the effectiveness of different warehouse layouts and product storage assignment strategies by simulation. Upload sales orders directly to the online tool to optimize pick route and pick lists without programming or integration required. The dashboard in your warehouse profile provides information on your API usage and historical pattern. You can also download the raw data for operational analysis offline with other applications. Model the physical location of depots, storage racks, directional aisles, paths and obstacles digitally. Visual map aide for guiding pickers to pick locations in warehouse to expedite order fulfillment process and reduce picking time. Additional user accounts can be created to delegate warehouse configuration. Authorization and access to the system can be easily configured anytime.